New line beer filling line at Highgate Brewery. buyout by Smethwick-based Global Star which has given “a new breath of life” to the Sandymount Road brewery. 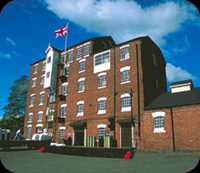 The company owns more than 100 pubs in the region. As part of the new era at Highgate Brewery it was decided to invest in a new beer bottling line which was designed and supplied by specialist bottling equipment supplier; Enterprise Tondelli based in Bedfordshire with head office and manufacturing in Italy. 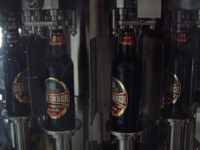 The new modern line rated at 2,000 bottles per hour has been specified to give premier labelling capability and also very high beer filling quality. With this in mind Enterprise supplied a three station rotary self adhesive labeller. This is sited before the filler to ensure no poor labelling due to condensation on a filled bottle. The labelling unit can apply both a body, back and also neck label onto a variety of bottles. A rotary unit was selected to achieve the high labelling accuracy not possible on an in-line labelling machine. Coding is carried out by hot foil printing on the label before application. 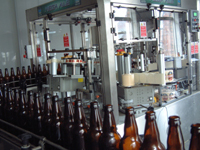 The filler manufacturer specialises in beer fillers and has references with some of the major continental brewery groups. The filler at Highgate is a modern monobloced bottle rinser, filler and crownerand is a compact single unit to reduce space required and also allow easy access for the operator. The filler has a double pre-evacuation filling valves which in tests carried out in Leuven University in Belgium the filler picked up less than 50 parts per billion of oxygen during the filling process. The filler also has a closed circuit cleaning in place facility for sanitation and to ensure good hygiene. The base frame of the rinser/filler/crowner unit is in stainless steel to give a long life and improve hygiene around the filling area. A mini hopper on the crowner reduces the need for constant operator loading of crowns. A shrinkwrapper unit for secondary packaging was included as part of the line to reduce the carbon footprint rather than cartons. The shrinkwrapper is complete with conveyor for palletising. Highgate Brewery believe that the high specification of the line will ensure that it give best quality to their own brands such as Davenports, Fox’s Nob, Old Ember etc and allow them to offer a quality contract bottling service for other smaller and micro breweries. In fact they have already secured several new contracts for bottling for other breweries and brands. Mr.Stephen Brooks who used to brew at Marston’s said: “Although I came into the project quite late on in the day I was impressed by the equipment supplied and the service and attention to detail given by Enterprise Tondelli. I understand that they usually supply medium and large bottling lines but they put the same effort into our project. We believe we have a great line here that will be very helpful in expanding the business and the range of services we can offer in the industry. In fact this is the first of several site and production developments that will be coming through in due course.”. The complete project was supplied by Enterprise including all the conveyors to give a turn key project. Enterprise Tondelli supply lines from 500 bottles to 5,000 bottles per hour. For high speed lines Enterprise can supply up to around 66,000 bottles per hour. Enterprise Tondelli are just completing major equipment deliveries on other beer bottling lines rated at 24,000 bph and 42,000 bph – both in the UK.